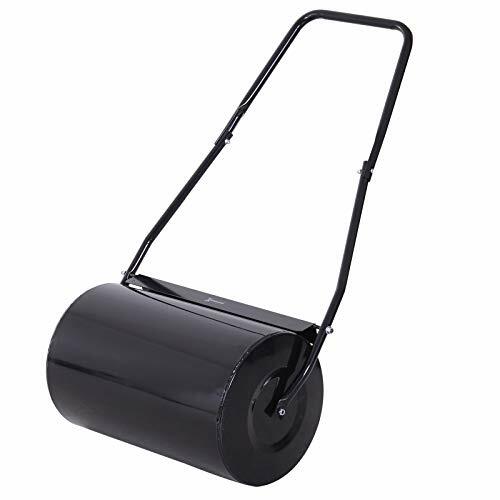 PREMIUM MATERIAL: This garden roller is made of steel and is spray treated to prevent rust. Rounded edge for best rolling results that will not damage your lawn when turning. U SHAPED HANDLE: U shaped handle for comfortable pull and push use, it is easy to operate and will not hurt your hands. DRAIN PLUG: It includes a drain plug for you to add water or sand (38L capacity in total), ideal for flattening uneven ground caused or packing down newly sown seed or sod. Fill and empty with great ease. CONVENIECE: Provides versatility for rolling tight areas and open spaces, easy conversion offers you great convenience in rolling. EASY STORAGE & TRANSPORT: It only weighs 17.6lbs without water or sand for easy storage and transport. Some assembly is required. This push/tow lawn roller from DURHAND is ideal for flattening uneven ground caused by moles or frost-heaving and packing down newly sown seed or sod. The roller inside with 34L capacity so that you can fill the water or sand, easy to fill and drain with large filling hole. Comes with black sprayed surface, not easy to rust, its smooth edge will not damage your lawn when turning. Stylish and functional, it is a must have for your patio accessories!